The last few days have not been great. In some ways I have done well, but in other ways I think I’m doing worse than I thought. I did not expect to feel any side effects for 4 to 5 days. I had chemo on Tuesday and only slept about 3 hours that night. Probably due to the steroids they gave me in my IV. Wednesday morning I got up, ate breakfast and went for a 1.5 mile walk per the doctor’s orders. I felt pretty good on Wednesday except that I was exhausted from lack of sleep. I did take a 2 hour nap and was able to make it to church that night, but as soon as we arrived home from church I went right to bed. Thanks to everyone’s prayers I slept 8 hours on Wednesday night. I felt much better on Thursday. I was sort of queasy in the morning so I decided to take one of my anti-nausea pills. It was a mistake. It made me too drowsy so I struggled the remainder of the day to get work done since I was so groggy. I ate crackers for lunch with a little bit of cream cheese on them. I was scared to eat anything else. For dinner I just had veggies, no meat. Kevan made me a smoothie last night and it tasted really good. I woke up at 4am last night and thought I was going to be sick. So, I took a Zofran tablet (a different anti-nausea med they gave me). I think it was a mistake. I have been drowsy ALL DAY! I can barely stay awake and my whole body feels numb. I guess I’m going to have to live with the nausea because I can’t function on the anti-nausea medication. I need to be able to work! I’ve missed having coffee in the morning. I’ve been scared to drink it because I don’t want to make my stomach sick. All I’ve eaten so far today is a little bit of Cream of Wheat and a few crackers. Other side effects I’m having is a rash on my chest, my jaw is very sore and my scalp feels very tender. Also, Kevan said I was snoring really loud when he came to bed last night. I don’t normally snore, but my mouth and throat are swollen so I’m guessing that is what caused it. 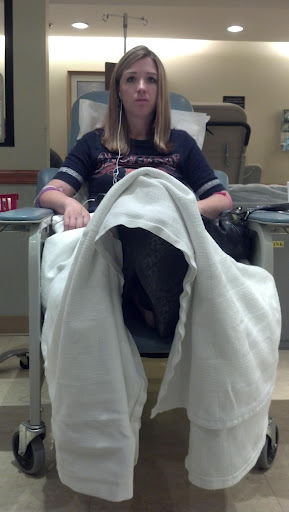 So….the chemo is in my body. The countdown to hair loss begins! No turning back now. I am conflicted on whether I’m going to use my hair dryer and straightener. Everything I read says not to because the heat will make it fall out faster, but I hate my curly/wavy hair. Maybe I’ll just do it once a week on Sunday for church. But, if I’m only going to have hair for 14 days…does it really matter if it is only for 7? What do y’all think? If some of the below is “wordy” it is because I want to remember it for later in case I need to refer back to it. I brought up my oncotype score of 70 and I was so glad I did. The oncologist explained that pre-menopausal women always have a higher score. That is why so many of the numbers I was seeing online were so low because most women that have breast cancer are post-menopausal. He said due to my age, menopause and the aggressiveness of the cancer that is why my score is so high. He said it is actually a good thing because it means the chemo should work and get rid of any other cancer cells lingering in my body. Praise God! We waited around ANOTHER 30 minutes before a woman arrived to give us a little course in Chemo 101. I was given a big binder to read, additional documentation and she was very helpful in circling the most critical items. She answered any questions we had and was very sweet. She’s instructed me to rinse/gargle/spit a salt/baking soda/water mixture 4-5 times a day to prevent mouth sores. Mouth sores is a side effect of one of the chemo drugs. She discussed how I will probably GAIN WEIGHT (UGH!!) because I am pre-menopausal and this will put me into menopause during treatment. So, I guess I will have to go clothes shopping. :o( The doctor and her both mentioned things that can help me from gaining weight. I need to make sure I eat breakfast and exercise in the morning to rev up my metabolism early in the day, eat good throughout the day (whole foods, not sugary/fatty foods) and not eat after 7 or 8 at night. Since we live in Central time, but “live” on Eastern time (for work purposes) I am not sure which time zone to choose. I guess Eastern. She also discussed “chemo brain” with me and how I will start forgetting things and how to prevent it. One of the items was to “work on one thing at a time”. That is going to be hard for me. I’ll have to take lots of notes. Also, she said I can go to church even though I will be around so many, but I shouldn’t hug or be around others that are sick. If I see someone coughing or sick next to me I need to move, I need to use hand sanitizer all day long and I cannot be around kids if they appear sick. Also, if anyone comes to visit me they will need to wash their hands as soon as they enter the house. They hooked up my IV into my right arm. [Later my PT said this was a bad idea and that I need to use my left arm from now on since my right arm is my dominate arm. So, if I’m going to develop lymphedema I want it in my left arm, not my right.] First off, she pushed saline through my IV. I’m one of the lucky ones that can taste it. She said that was a good thing because it tells her she has a good vein. Then, they gave me a steroid drug through the IV, followed by 2 anti-nausea drugs. Then, they gave me Taxotere. Some people have allergic reactions to it within the first 5 minutes. I had no reactions (Praise God!). It took about 45 minutes for that one to finish. Then, they added the Cytoxan. Almost toward the end of this one I started to develop a weird sensation in my nose, like I had went swimming and got water up my nose. It was awful. I had to keep laying my head back and holding my nose. It remained the rest of the time. The nurse said I was one of the lucky 1 in 10 to develop this and it will happen each time. They don’t know what causes it or why I am so special. Oh yay! Once chemo was done it last about another 20 minutes. It wasn’t a pretty bad side effect, just annoying. So, the chemo is in my body, I’m drinking my water and trying to go to the “little girl’s room” every 2 hours as directed. Which, I don’t have to set an alarm for…..I HAVE to go. lol! They sent me home with 2 anti-nausea drugs and a list of side effects that would be urgent if I experienced them and would need to call their office immediately (even at night or on the weekend). They were like, fever over 100.5 F, vomiting/diarrhea over 24 hours, etc. After we left I had to stop by to see the Physical Therapist just to show her my scar banding so she could refer me to a PT closer to my house. She found one, but she is on vacation so I won’t start PT until 7/9. :o( They are going to do massaging and stretching to relieve the scar bands. I am praying it works because it is pretty painful. I didn’t want yesterday to be a depressing day so we decided to go out to dinner before my nausea kicks in a few days from now and to see a movie if I was up to it. My MIL was with us all day providing support and encouragement (wasting her whole day) so we took her out to PF Changs, one of her favorite places. 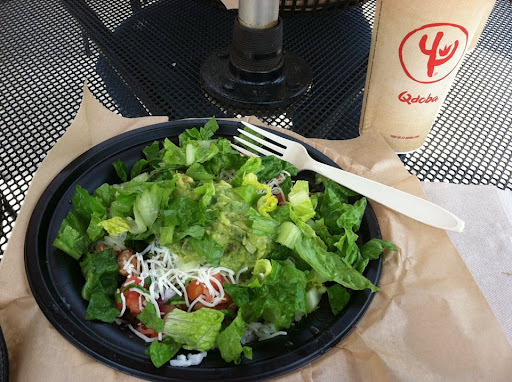 I didn’t eat too much because I was scared to get sick, but it was all really good. Afterwards, my MIL’s cousin met us somewhere to take her home and we left to head home. Then, we had to stop at a McDonald’s and use their restroom. I decided I wanted to go to the movie so we stopped on the way home to see “Brave”. We had 2 free movie tickets (and popcorn) from my oncological surgeon because we had to wait so long that day he wanted to do something nice for us. So, our movie trip was on him. :o) I did eat popcorn and it tasted pretty good! I had to get up to go to the bathroom and as I started down the steps to the bathroom my legs were VERY weak. I had to hold the handle. I wasn’t sure if I got up too fast or if things are starting to happen already. I was pretty sad because everyone keeps telling me that the side effects won’t appear for a few more days. I need to work this week. So, I’m praying they hold off until Friday night or altogether! I had to use the restroom twice while we were at the theater. lol! I’d say I’m pretty hydrated. On the way home Kevan stopped to get me my favorite smoothie from Panera (Mango Smoothie). It didn’t taste right. Tasted like orange not mango. He tasted it twice and said he tasted mango. Weird! It wasn’t as good to me as they normally are, but I drank it all. LOL! We arrived home at 11:30 EST, I fell asleep around 12:30, slept until 2:30 (used the restroom and drank my water), didn’t fall back to sleep. Got back up at 4:30 to use the restroom/drink water. Then, fell asleep about 5am and woke back up at 5:45 chilled. When 6am rolled around I just got up. So, I only slept about 3 hours last night. I’m exhausted. I’ll have to take a nap today. Also, speaking of great things….I am so blessed to have medical insurance. This is not a burden for us and I know it is for so many going through this. We have had to pay out of pocket (about $4,000) so far, but God has provided what we have needed so far. I am truly blessed to not have to worry about how we will pay for these bills. Thank you Lord. I love you and I know you are blessing me so much throughout this journey. Other than the not sleeping well (probably from the steroid) I’ve only felt a little strange (off-balance/clumsy) a little. If I sit up too fast I get very dizzy so I’m trying to train myself to move slower. Also, my arms and legs are a little weak. I think I’m going to visit the bathroom and then try to take a nap now before I start work for the day. Thank you all for your prayers. I surely felt them yesterday. I start chemo tomorrow. Ugh! Not looking forward to it, but at the same time I just want to start so I can get it over with. I’ve been trying to prepare for the unknown. I cut my fingernails down and will be putting nail strengthener on them to try to save my nails. I’ve read that the chemo I’m doing (cytoxan and taxotere) can sometimes cause your nails to fall off if they get bruised or brittle. So, I’m trying to prevent that from happening. I’ll let you know if it helps. After my mastectomy/reconstruction surgery one of Kevan’s family members made us several lasagna in different sizes that we could freeze and use as needed. It was wonderful. It was such a great idea I asked her for the recipe so I could make more and she was so gracious to give it to me! 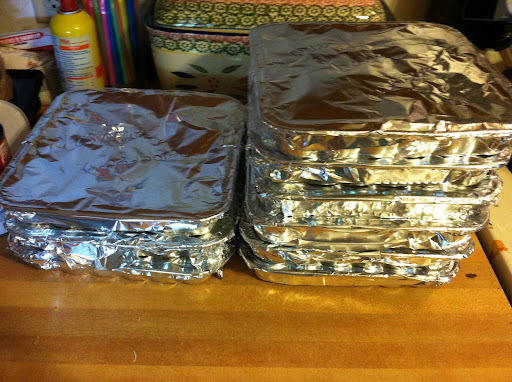 I also decided to make a bunch of my favorite chicken and broccoli casseroles to freeze as well. I want to make sure that Kevan has dinner on the nights that I don’t want to eat or when I’m too sick to cook for him. Also, if I’m up to it I can eat too. On Saturday I spent a few hours making homemade sauce, cooking meat, etc to make up several casseroles. I started at about 11am and was finished by 5pm. 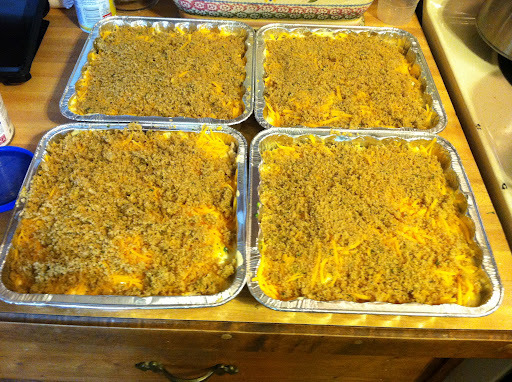 In total I made 10 casseroles. While the sauce was cooking I was able to clean the house a little so even though I had started the cooking I still had the opportunity to do other chores. This is a good idea for working moms and new mommies too. 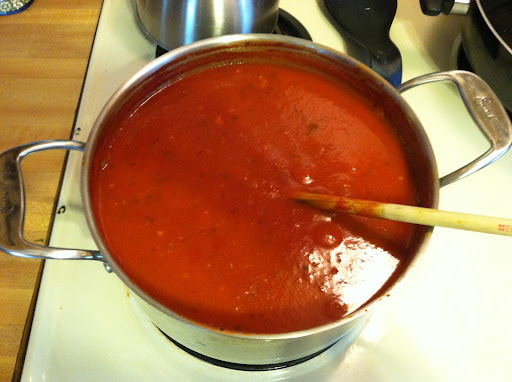 Here is a picture of the sauce. Yum! I cooked 6 chicken breasts in my crockpot while I waited for the sauce to be ready. Then, shredded the chicken, seasoned it and then put together 4 chicken/broccoli casseroles for Kevan and I. Since we do not need a 9×13 for just the two of us I split them in 1/2 so we would have 4 dinners instead of 2. I was going to make 6, but I did not end up with enough chicken to make 6. 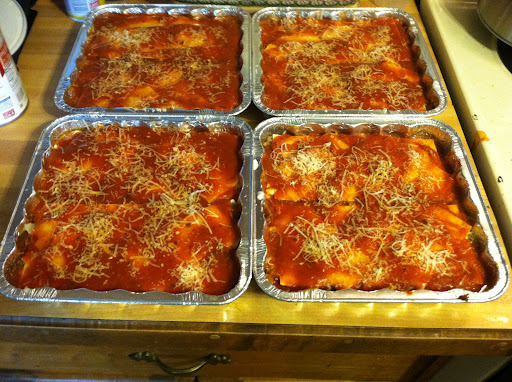 Then, once the sauce was finished and cooled….I put 6 lasagna(s) together (only 4 are pictured here). I wrapped each one with plastic wrap, then foil and labeled them. To use later I just thaw them throughout the day (or overnight in the fridge) and then cook them as normal. Here is what they looked like before I put them in the freezer. This should get us through at least 5 weeks of dinners twice a week. One day a week is usually taken up with doctor’s appointments in the “city”, we usually eat out once or twice…and hopefully I will be up to cooking the remaining days. We live way too far from town for pizza delivery, but maybe Kevan can drive to town and pick up a pizza sometimes. Unfortunately, I love Pizza Hut way too much…my thighs don’t love it, but my taste buds sure do. I also froze some vanilla yogurt in 1/2 cup measurements, added them to bags of various frozen fruit to use for smoothies. I may not be up to eating, but Kevan can easily make me a smoothie and it will at least provide me with some good nutrients. BTW…I love Stonyfield’s French Vanilla yogurt and I searched all over online for a good homemade recipe. I never found one so I came up with one myself. I believe my homemade vanilla yogurt recipe is as good as theirs. Mine has honey instead of sugar too so it is better for us. I’m very excited that mine turned out so good. I even had time to make some good ‘ol potato salad for a church get together while I was waiting on the chicken and sauce to finish. I cooked the potatoes and eggs (separately) in my pressure cooker. It took about 20 minutes total. Then, assembled it and had it in the fridge in no time. I love my handy dandy electric pressure cooker! The shell falls right off of the hard boiled eggs. I think I had a very successful Saturday. If you have time please say a prayer for me. Pray that my chemo side effects are limited to just hair loss (or weight loss). That I won’t experience bad nausea or low blood counts. I’m pretty worried about the emotional and hormone aspect of the treatments so please pray for our marriage during this time. Lastly, pray that I will continue to rely on the Lord for my strength and healing. I had an appointment with my plastic surgeon’s office today. I had my 3rd fill (60cc’s baby!) and now I am the size I was before my surgery. I look so much more normal now! It is amazing. I am praising God because I was really worried there for a few weeks. I remember the hours of crying after I would look in the mirror and now….I look pretty good. I still have my scars, but I can live with them! They will eventually turn white and won’t be as noticeable. The expander is no longer “lumpy” and is much fuller so the skin on the outside looks normal now. Yay! If you are going through this and you are discouraged….just know that it only took me 6 weeks to get back to my pre-Op size. That isn’t very long at all. My chest is very hard again, but it will soften as the days go by between fills and the skin stretches. She also said when I have my final surgery they should feel normal again (big relief!). It had been 20 days since my last fill so I had time to soften a little bit and the skin had more time to stretch. It was way more comfortable getting the fill this time. I think the extra week between fills really helped. I took 2 Advil before I arrived and I have a little bit of pain, but not too bad. Just feels like a sore muscle across my chest. I have no nerves left so I can’t feel a thing while she’s doing the fill, just pressure, it is weird. lol! She said I will probably only need 1 or 2 more fills. During my next office visit she is going to scan in my picture and use software to show me what I will look like post final surgery. My oncological surgeon told me about their software and he said it is pretty accurate to what I will look like in the end. This will be the appointment where we finally discuss “size”. I think Kevan is really looking forward to this appointment. lol! Also, I showed her where my skin is pulling on the outside of both breasts when I extend my arms. It is causing me pain/discomfort when I’m reaching or putting my arms over my head. She believes it is scar banding so she’s referred me to the physical therapist. She thinks the PT will be able to massage it and do some exercises with me to help it and maybe fix it altogether. Great news to me! She said it happens to a lot of thin, tall women. I guess we are the wimps that don’t do our exercises soon enough because we are in pain. :o) That is what caused it….not doing my exercises that first week I arrived home. I tried, of course, but would give up because it hurt so bad. Remember, don’t be Jayde! Do your exercises! She also lifted all restrictions this week! I can go to the gym, take baths again, wear a normal bra, go in a hot tub or pool. Yay!! The only thing I cannot do is lift over 30 pounds. Also, she noticed that my N’s are looking good and the pigment is looking good too. Praising God again for that! We went from almost black N’s (eww!) that had blood flow problems during Post-Op Week 1 to having N’s that look like they did before surgery. Another big praise! Thank you all for your prayers. It is so strange talking about my breasts and my N’s, but this is an important part of being a woman. Especially a married woman who wants to look nice for her husband. If I had my arm or leg cut off, wouldn’t I look into getting a prosthetic? There are so many women out there going through this and I just want them to know that even through the struggle God is there, helping us, comforting us and giving us hope. He even cares about our N’s. I know some women don’t get to keep their N’s, but He is still there with you and if you don’t get to keep them He has given doctor’s wonderful N making skills. It is pretty crazy how real they look. I just have to keep telling myself that I am blessed. 50 years ago they didn’t have the new methods they do today. I would not have looked this good. I have breast cancer and could’ve (or could still) die. Getting rid of the cancer is more important than how I look, but how I look to my husband is runner up for me. It is a blessing that during this struggle I have good doctor’s to help me with both. Thank you Lord. You are amazing. As of yesterday, I am 6 week’s post-op. I am doing so much better physically. I was able to fully clean my house last Saturday (mopping, vacuuming, etc) without much pain and it was wonderful to be able to do it on my own. I really don’t have pain unless I’m reaching…like when I clean our jacuzzi tub or help Kevan hold 2×4’s above my head while he’s putting up our deck roof. Or if I’m bouncing…like when Kevan asked me to tow the tractor through the pasture using the 4-wheeler. It was pretty bouncy and I didn’t realize the pain I would be in until afterwards. I am sleeping a lot better and have only been waking up once or twice a night. I have gotten to the point now where I forget that I had surgery (if I don’t look or feel) and the very painful first few weeks are almost a blur. It is amazing how we can forget the pain. I guess that is why women go on to have multiple babies even after a painful birth. Thankfully, each day gets easier and the bad times are forgotten. I will be starting chemo in 6 days! I’m sort of freaking out. Every day I try to cherish the hair I have because I know in a few VERY short weeks I won’t have any. This means head hair, eyebrows, eyelashes, nose hair, arm hair….you get the point. :o) Right now, my bad hair days are great days! Also, I’m trying to think of everything I want to do before next Tuesday. Just in case I have side effects I want to have the house clean, laundry done, work caught up and food ready. I’m also hoping to make a bunch of frozen meals this weekend. This worked out so well when I had surgery that I want to make sure we have things like this available again. It is so easy for Kevan or I to grab a casserole out of the freezer, let it thaw during the day and then stick it in the oven. Also, I like to throw all of our smoothie ingredients (homemade yogurt cubes, fruit, etc) into individual baggies so we just have to dump it in the blender for a quick breakfast or snack. Kevan has reminded me how important antioxidants are right now and blueberries will definitely be in the baggies. Also, while reading one of my breast cancer books I learned that yogurt is one of the top 5 best foods for hydration. So, any help I can get there is great since I will already be pushing myself to drink more water. Tomorrow I have an appointment with my plastic surgeon for another “fill”. Strange to type the words. I have a “plastic surgeon”. I never thought I would write that. I am so glad that God has gifted some doctors with the gift of plastic surgery. I would be left with a very unflattering body if I had just had a mastectomy with no reconstruction. I am blessed. I know that a lot of surgeries are for cosmetic reasons, but I know they do huge miracles for some who were involved in accidents, have cancer, etc. I’ve seen it first-hand with my brother. He was in a car accident when we were in high school. I made it to the hospital before they took him into surgery. He went through the windshield and back out again (he wasn’t wearing his seat belt). You can imagine what that could do to someone’s face. It was awful to see him like that and I know it was even harder for him. Today, he is just as handsome as he always was. No one would even know that he was ever in an accident. So, I am praying and holding onto miracles that I will look as good as I did before. I wasn’t perfect before so I am not looking for perfection. I will even be okay with the scars if it means I will feel normal and look somewhat normal again. Please God! Something I have not mentioned on my blog (I don’t think) is that I have gained 10 pounds since my surgery. I have no idea why. Saline cannot weigh more than my old breast tissue, can it? Maybe it’s because I have not been doing much physical exercise, but I would’ve never imagined I would gain 10 pounds in 6 weeks! So, not only am I unhappy with how I look due to surgery….now I am REALLY unhappy with how I look because I have gained weight. Some have said I will lose it during chemo, but I have not been able to find evidence of that. If I do….it will be one of the blessings of chemo. I would love to lose about 20 pounds….and please no comments about how I don’t need to lose weight. I REALLY want to fit into my clothes and lately my clothes options are diminishing greatly. I hate shopping…so I don’t think clothing options will improve much unless I lose some weight. I don’t really have much else going on. 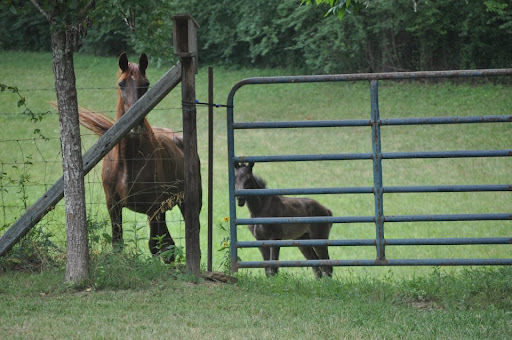 For those who aren’t on my Facebook the only other news this week is that the “wild” horse, that lives on our property sometimes, had her baby. I’ve been praying for weeks that she would have her baby on our property so I could see it! The baby is adorable, but this was the best picture I could get since they run when we approach them. We bought some sweet feed and we are trying to lure her into being friends with us. And the kitty that lives in our barn had kittens. 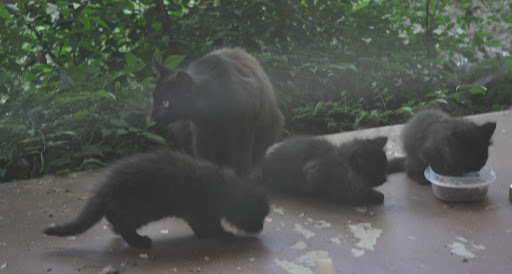 They have to be at least 4-6 weeks old since they are coming to the porch for dry food. They run from us, but I’m hoping at some point they will let us pet them. It isn’t a great picture since I had to take it through the window, but you can still see their cuteness! 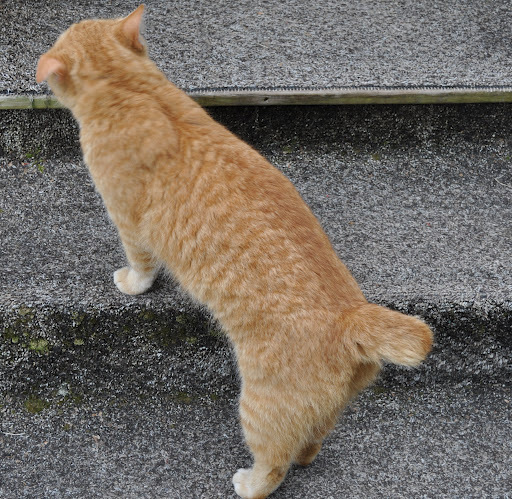 Also, we think Bob is the father and I am soooooo happy they all have tails….unlike Bob…who has a stub. lol! So, even through this difficult time…God is giving me little blessings. Well, in my last post I mentioned how I was unhappy with my range of motion. Well, turns out it isn’t the tissue expander sutures at all. Actually, it is my fault. Oops! I guess my sutures have already dissolved so I can’t blame it on the sutures anymore. Due to my lack of arm exercises I’ve developed scar tissue and that is what is pulling whenever I try to use my arms. So, what did you learn? DO YOUR EXERCISES! Don’t be Jayde. She said that I should be able to still get back to where I used to be (she’s seen worse! )…but I need to really start to do my exercises. The sad thing is…..I read my doctor’s email last night and um…..I have only done them once so far today and it is almost 8pm. I guess I’d better get off of here and go do some exercises. Also, wanted to ask for prayer for my N’s again. I don’t want to go into too much detail (since men read this too!) but they need some prayer. I guess I’m having blood flow problems again that is causing some pigment issues [update from Kev: there are actually no blood flow issues, Jayde has healed excellently with respect to that, the issue is that some of the healing areas do not have the same level of pigment, that is all, typical of scar tissue, Jayde just misunderstood that section of an email from her doctor]. :o( My poor N’s. They’ve been through a lot. They need prayer. If you don’t know what an “N” is….you can read this post. I’m a little embarrassed using the “N” word so I just shortened it to “N’s”. It just sounds so much better! Each day I seem to feel better than the day before. Which is such a blessing. I slept better last night, but still had to keep waking up to reposition myself to help with the pain. I am so thankful though as it is not as bad as it has been. 7 more days until my next “fill” and 12 more days until chemo. Eek! It has been 5 weeks since my bilateral mastectomy/reconstruction surgery. It feels like it has been longer than 5 weeks. I haven’t taken any pain medication (advil, aleve, etc) in over 5 days. I still have pain, of course, but I can deal with it. Since I’ve started back to work I’ve noticed that I have to get up and walk around every hour or two and stretch my muscles or my chest starts to really hurt. I could probably take something, but my stomach was really having a rough time with the ibuprofen. So, I decided the muscle/suture pain was not as bad as the stomach issues. I’d rather just deal with the pain. Chemo starts 2 weeks from today. That means, my hair will start falling out in about 1 month. I made the mistake of researching the two drugs (cytoxan and taxotere) I will be getting in my chemo “cocktail” before I went to bed the other night. NEVER do side effect research before going to bed. It will just make you worry until you finally fall asleep from exhaustion. I did learn a few things though. Those that mentioned minimal side effects drank LOTS of water after their chemo infusions. 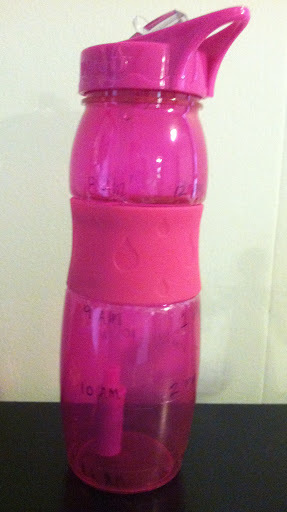 So, I will try to remember to drink water….I am not big on drinking anything. I usually start with a drink in the morning and I’m still drinking the same one in the afternoon. So, I will have to force myself. Also, they said to use “Hard as Nails” to keep your fingernails from falling off. I guess that is one of the side effects of one of the drugs and most of the posts I read…they lost their nails. I will try that as well. Also, I tried to find someone online with an Oncotype score of 70 (high risk of recurrence), but I couldn’t find anyone mentioning that high of a score. 54 was the highest I saw and most were in the teens or 30’s. My age and that high score were the reasons I’m having to do so many rounds of chemo and Tamoxifen. :o( If anyone reading this is a breast cancer survivor with an Oncotype score as high (or close) to mine will you comment and let me know how long you’ve been in remission? I’m just curious. I am still waking up several times each night because of the pain from the TE’s. It is mostly because I try to lay on my side or I move my arms and the pain wakes me up. I’m also still dreaming about removing whatever the bra is that is causing my chest pain. lol! You would think after 5 weeks my brain would realize it isn’t a bra and it can’t be removed, but I woke up trying to get it off again this morning. I am literally using my arms to try to locate it to remove and I can’t find it…that is when I wake up. lol! I’m no longer having bad dreams. I’m guessing that was from the heavier pain meds or the valium I was taking. I’m thankful I’m back to good dreams or the ones I don’t remember. Also, I still have to lock the cats out at night. They used to sleep on my chest so obviously this is a huge issue and I get tired of fighting with them all night long and moving them. I am surprised at how sore my chest is still when I push on it. One really freaky thing is….if I scratch my nail over my breast skin….I can’t feel it at all. AT ALL! There are no nerves left I guess. Now, if I push on myself I can feel pressure, but it is not at all like it used to be. :o( It is just freaky. One wonderful thing about today is….Kevan gets home today!! I cannot wait to see him and hear all about his mission trip. I’ve really missed him. It’s been 10 days since I saw him last. A very long 10 days. He called me last night when he crossed the border back into the US. It was great hearing his voice. He sounded tired. But, still excited from everything. His phone was dying so we were only able to talk for a few minutes. As I’ve mentioned in previous posts…I love older books. I doubt many of you are familiar with the book, “Pollyanna” so I will explain the title of my post. In the 1913 book, Pollyanna loses her parents and has to go live with her aunt. Before her father died they would play the “Glad Game” which helped her feel better when things didn’t go her way. At one point she wanted a doll and when the missionary supply barrel came in there was nothing in it for children except a pair of crutches. So, she cried because she didn’t get a doll. Her father explained to her that she shouldn’t cry, but be glad it was crutches. She didn’t understand why anyone would be glad for crutches. He explained that she should be glad because she didn’t need them because she had two good legs. So, she was glad and it became a game with them from then on. I love this book. It really isn’t that cheesy…it really is a good book. In the end, Pollyanna has the whole town playing her game and changing so many of their lives for the good. It is a very cute book for parents to read with their kids…girl or boy. It has very funny parts for adults too and you can follow it up with the movie. Also, it is available for free at Gutenberg.org and for the kindle. I know some have made comments or thought that I am unrealistic or overly optimistic for “someone that has cancer and a long road ahead of them” and at some point it will hit home. I don’t think so. At least I hope it doesn’t. I try hard to see the blessings instead of the hard times. If I’m always focusing on the pain and the trial….I miss out on the blessings. Why would I want to miss out on the blessings? There are times, of course, that I do feel sorry for myself or I have a bad day, but I hope they are not as often as the times I see the blessings (or glad-ness) through the pain. I don’t have Stage 4 and it was just Stage 1. I am not alone….that I have a loving husband that still thinks I’m beautiful. I have so many praying for me and who love me. I can work from home during my treatment. I still have hair for a few more weeks! Yay! When you are having a bad day, find out bad news, in pain…whatever your circumstance…play the glad game. There has to be a blessing out there…you might have to look hard, but I’m sure you’ll find one. If it is morning and you are grouchy….be glad you have coffee. ;o) If you were just in an accident and it totaled your car, be glad that you were okay. It is just a car. If you are diagnosed with cancer, be glad we have a Savior and a God that loves us and will comfort us and give us strength to get through it. I started back to work yesterday. This probably means the blog posts will be fewer because I won’t have much time. I have been off for 5 weeks. It is great to get back on my normal schedule. I didn’t realize how much I missed work and missed my co-workers until I started back yesterday. It has been great to hear everyone’s voice again. Most of you know, I work from home. I am really blessed that I can still recuperate at home and I don’t have to rush to get ready, drive to work, etc. I am feeling the “rush” of work already though. lol! But, it is a good thing. Takes my mind of cancer, chemo and Kevan being gone. I only have 19 days left until chemo starts. Eek! I am finally sleeping without having to prop myself up…..which is wonderful. I’m sleeping pretty much straight with just two pillows under my head. Hopefully, in a few days I’ll be back to just one pillow. I was able to finally sleep on my side a little last night. Yay! I am a stomach sleeper and, of course, I have not been able to sleep on my stomach. I hate sleeping on my back so it was SO nice to finally be able to turn a little without much pain. It did hurt after a while (I think it was the TE sutures pulling), but I was still excited to be able to do it even for a little bit. Each day brings more things I can do once again. It makes me appreciate all the little things that I took for granted before. I haven’t talked to Kevan since he arrived in Mexico. It’s been hard. I can send him emails while he is there, but he has no way to reply. I’ve been emailing him each day and they print it off and give it to him at breakfast. If you are reading this and want to send him encouragement let me know (through email or FB) and I’ll send you the email to send it to. He would love to receive encouragement from others. Hopefully, he’s keeping a journal so he can remember the things he experienced and won’t forget to tell me. Also, some pictures have been uploaded to FB. 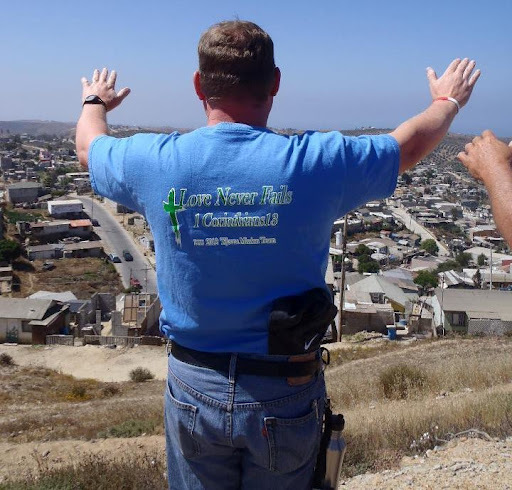 Here is a picture of Kevan praying over the town they will be ministering too. A beautiful picture of my hubby doing one of the most incredible things that God has gifted us with. Prayer. We are so blessed that we can pray to God….the Creator of all things. He listens, answers, loves and cares for us. Amazing. I don’t really have much else going on. No doctors appointments for 2 more weeks. I still have quite a bit of pain in the afternoons, starting around 3pm. Mornings are my best time. Night time is a lot better and I’m able to sleep at least 4-5 hours now without waking up in pain. I miss taking baths, I hate that I still have to take pain meds and I really hate that my chest feels like 2 big rocks (literally)! I still wake up trying to figure out why I have a bra on and why my underwire is puncturing me. Then, I realize, “Oh ya, that’s not a bra, that is my body. My weird freaky body”. lol! But, I know this is only for a time. So, I will just continue to pray for strength, healing and acceptance. It is hard for me to accept. 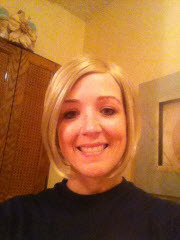 Sometimes, I want to go backwards to when I looked normal, wasn’t in pain and didn’t know I had cancer. It is strange that sometimes during the day I even stop and think “Really? Is it true? I have breast cancer and I’ve had a double mastectomy?” I guess because it has only been a short time and this all happened so fast. It is just hard to believe it’s me with these 8 scars and more coming later during my final surgery. I feel like I’m whining. Lol! So, I better end this post. I love you all and I thank you so much for your prayers for me and for Kevan. I emailed my doctor to make sure it was okay to not wear a wrap or a bra since I had read online that some mastectomy/reconstruction patients were told they must at all times in order to provide support to their tissue expanders. Well, she said since my TE’s are sutured in I can go without support. This was music to my ears! I feel a lot better without all the pressure. When I’m home or sleeping no more bra! I know that is TMI, but I’m trying to help those other ladies out there who are struggling like me. My doctor also told me to “Quit reading online!” lol! She explained that all doctors are different and each patient is different and if I have a question just email her. Today is June 5th. Two special things are happening today. It is my parent’s 41st Wedding Anniversary! I wish I was there to celebrate it with them. 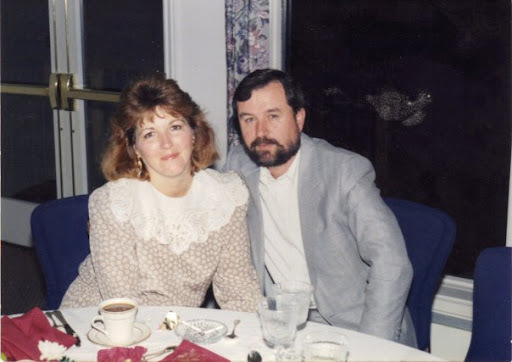 I hope/pray that Kevan and I will be married at least 41 years. I pray God heals me of this cancer (with no recurrences) so we can live out as best friends until we are old and gray. It is so amazing and such a blessing to have parents that are still together and have been able to live out so many years as best friends who love each other. Even through the bad times they always worked it out and their children saw their struggle, their forgiveness of each other (if it was needed) and their love through it all. They were always very affectionate towards each other (and still are) and I’ve always loved that I have parents that aren’t scared to show how much they care about each other. God has surely blessed you both! 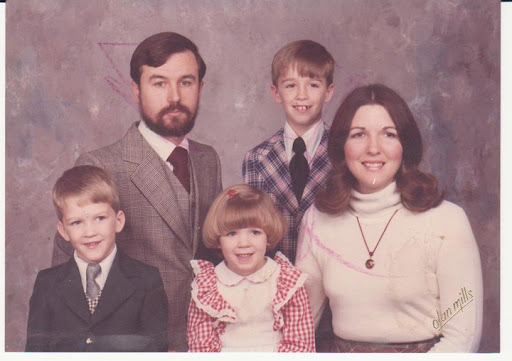 Also, growing up….there was hardly a night that they didn’t tell me they loved me as I went to bed. I’m thankful for the parents God gave me. Here is a funny picture of us when we were all much younger (before Tasha came along). I am not at home so I couldn’t find a family picture that Tasha was in too. Oh, and yes….I’m the mushroom head. lol! Sorry mom…I know you say that haircut was really the rage back then, but I cannot believe a bowl cut was in style. The other special thing today is that my husband is at the Nashville airport getting ready to get on a plane to Mexico for our church mission trip to Tijuana. Please pray for their safety, time there and that God will work in their hearts and the hearts of those they come in contact with.